Tangy, with a hint of sweetness, rhu-sins are my budget alternative to dried cranberries. Sweetened, dried rhubarb, can be used in ways that fresh rhubarb just doesn't work all that well. 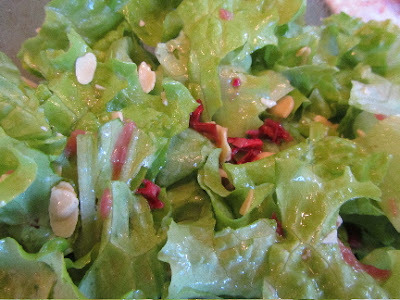 I use rhu-sins in homemade granola, added to nuts and chocolate chips for trail mix, tossed in a green salad with sliced almonds and a fruity dressing, baked in scones and cookies, as a topping for plain oatmeal, and snacking out of hand. 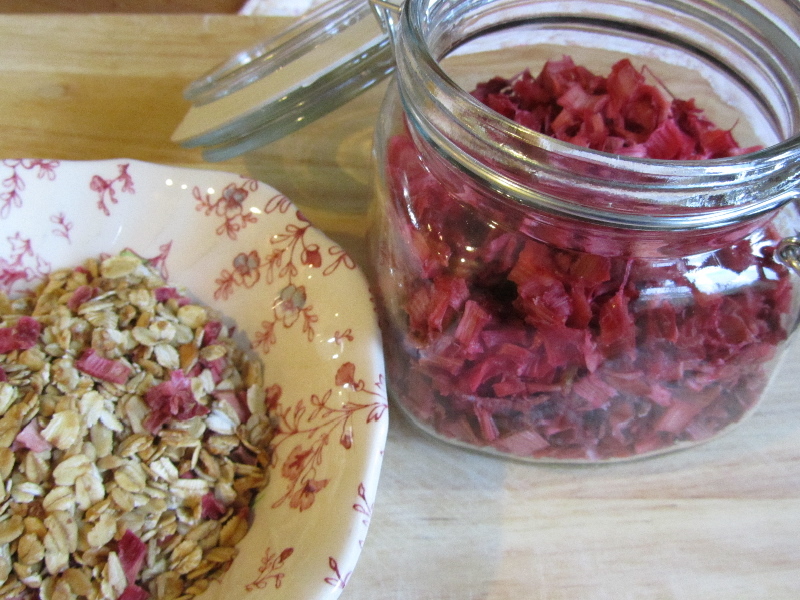 I can use dried, sweetened rhubarb in the same ways that I use dried cranberries, only these are almost free! 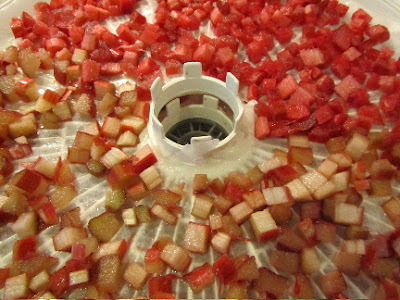 To dry rhubarb, I use a dehydrator and standard dehydrator trays. I lay a sheet of waxed paper over each tray, poking a hole in the center where the ventilation shaft is, and folding the corners under, so the paper fits the tray (does not have to be perfectly round, as you'll see). *And this next step is important* I spray the waxed paper with non-stick cooking spray. 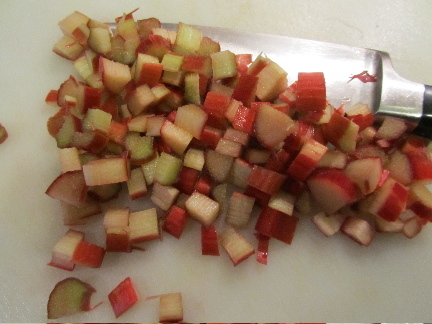 I wash and chop the rhubarb into dices between 1/4-inch and 1/2-inch. 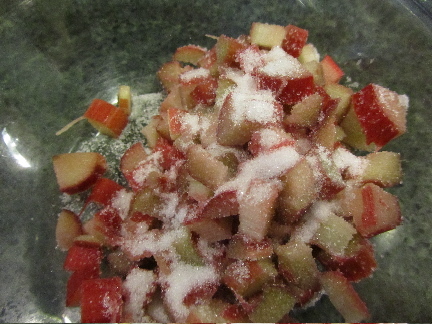 I toss the diced rhubarb with sugar, between 1 and 2 tablespoons of granulated sugar for each stalk of rhubarb. I only use the greater amount of sugar with very large stalks. I tend to prefer our rhu-sins a bit on the tart side. If you prefer a sweeter dried fruit, use the 2 tablespoons per stalk. Taste a couple of pieces raw, to get an idea of how sweet you'd like your rhu-sins. In my 4-tray set-up, I can dry 8 stalks of rhubarb at a time. This is about 10 cups of diced rhubarb. 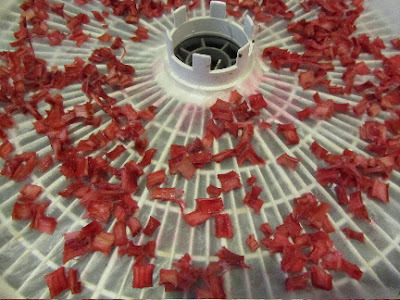 I spread the sugared rhubarb onto the prepared dehydrator trays, then stack the trays in the machine. I set the temperature for fruits/vegetables, about 135 degrees F. Allow to dry for about 8 hours, until the pieces are dry, but not hard. Too long of drying will leave you with hard pieces. Too little drying and your rhu-sins could develop mold. But this is standard for all fruit-drying. And that's it. 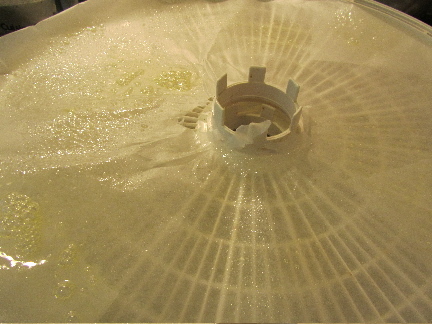 After the pieces are dried, I scoop them off the waxed paper-lined trays and store in an airtight jar. I dehydrate rhubarb from May through September, as our rhubarb plants allow. We find it to be a refreshing change of pace from raisins and dried cranberries. Lili, this is great! I also have an abundance of rhubarb and in the past, I will freeze it. However, with this method, I am going to try dehydrating the rhubarb this weekend. A couple questions, when you wan to use it in muffins, breads, do you re-hydrate it first, and if so, how? Also, have you done some with out sugar, so when you do make breads. etc, there is no added sugar? And for the final question, have you ever used it for pies? Sorry so many questions, but I love this idea! Have a great weekend! I've only done sweetened rhubarb. But I assume you could also dry it unsweetened as a way to preserve it. With baking, I use it in scones and cookies. I haven't tried it in muffins . In scones and cookies I add it dried to the dough. But like with some oatmeal-raisin cookies, you could rehydrate it in 1/8 to 1/4 cup water (I have an oatmeal-raisin recipe that calls for rehydrating the raisins for about 30 minutes). But you'd need to be aware that you would lose any sweetening when rehydrating the rhubarb, as the sugar is only on the outside. I think in pie, I would still prefer to use fresh or frozen rhubarb, unless the rhubarb was in addition to something like apples. I'd be interested in finding out how using dried, unsweetened rhubarb works in quick breads and muffins. Please let me know if you try it. I wonder if I would like rhubarb better this way? We had a lot of it when I was growing up and everyone else in the family couldn't wait for it to get ripe. I could even resist rhubarb pie which is the best thing ever invented according to some. I could see a non-rhubarb lover liking the dried, sweetened rhubarb in something like granola or trail mix. It's not at all rhubarb-y when combined with a dry mixture like those. But I do understand not liking rhubarb at all. It took me a while to find ways I would eat it. I would not go so far as to say that rhubarb pie is the best thing EVER. Chocolate or coffee probably fills that role, for me. What a neat idea. I can honestly say I have never tried rhubarb. Just won't grow well in my area and when I see it in the stores I tend to pass it by. I had never tried rhubarb until we moved to the pacific northwest. I grew up in California and just never saw it in the market there. I am guessing that my brother and sister have never, ever had rhubarb. My brother may not even know what it is! What a great way to utilize seasonal produce-I have noticed that so many of the dried fruits just continue to skyrocket in price. You share so many wonderful ways to utilize what we have in our gardens, pantries and freezer! Thank you. I do try to use what we have right in our own garden. I am always surprised over the price of raisins in the store, something that had been for many years a very inexpensive food, along with peanut butter. The things that school children have had in their lunches for decades. I know a lot of people have figured ways to use their ovens and cars (yes, inside a car, parked in the sun) to dehydrate fruit. The oven method works especially well with one of the old gas ovens that has a lit pilot light all the time. I made fruit leather in the oven many years ago, and that worked very well. When the strawberries are in full production, I'll make some rhubarb-strawberry fruit roll ups. Dried watermelon is so, so sweet. It is just like candy! Wow! What can't you do? :) Dried rhubarb is a great idea. My hubby dries cherry tomatoes, apples, and herbs in our dehydrator. He stores them in the freezer because as you mentioned, it seems difficult to hit the "sweet spot" between hard-as-a-rock and too much moisture. We have an Italian Prune tree in the yard, and I use a lot of the plums as prunes. I also store the home-dried prunes in the freezer, as I just never know if I've gotten all the moisture out. But at least the dried ones take up much less space in the freezer, than if I'd just chopped them fresh and frozen. I've never dried my own tomatoes, but maybe I'll try that this year. Those would make a tasty addition to salads. And packed in oil, they'd make a pretty gift, I imagine. Keeping my fingers crossed that this will be a good tomato year!! We have found if you cut them in half before you dry them, it seems to work better. Never thought about packing them in oil! Oh, I'll remember that. Thanks for the tip! What an excellent idea! I have always yearned for a dehydrater, especially when loaded up with free apples in the summer. I am waiting for the year when we have so many apples that I'm dehydrating a good share of them. What's your source of free apples? Do you have trees in your yard, or does someone you know have the trees? what a great idea. i have never dry rhubarb before,but i think i will it try. thanks for the wonderful tip!!! I hope you enjoy it! I've been eating the dried rhubarb by the handful. It makes a good, quick snack for me.